If nothing else, this video from the Mercatus Center will help you appreciate just how vast the regulatory state has become. The video mentions a report with additional data. Well, here’s some of what’s in that report. A 2005 World Bank study found that a 10-percentage-point increase in a country’s regulatory burdens slows the annual growth rate of GDP per capita by half a percentage point. Based on this finding, an increase in regulatory burdens can translate to thousands of dollars in lost GDP per capita growth in less than a decade. Hopefully all those numbers drive home the point that our economy is weaker and our incomes are lower because of needless red tape. And never forget that even small differences in growth add up to big differences in living standards after a few decades. Want more evidence? This chart, also from Mercatus, gives us a good idea. 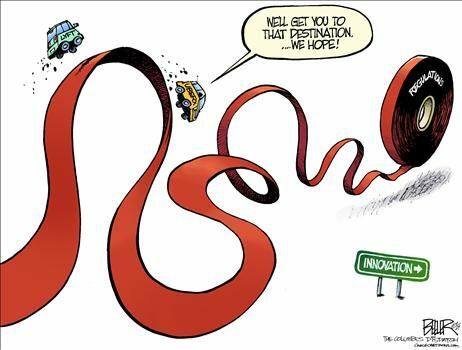 Industries that are heavily regulated had far lower levels of productivity compared to industries with less red tape. And remember that labor productivity helps determine wages, so both workers and investors suffer. By the way, if you’re interested in the methodology, here’s some of the explanatory text that accompanied the graph. Regulatory burden is measured using RegData, a text analysis tool that counts the number of binding words—“shall,” “must,” “may not,” “prohibited,” and “required”—that appear in the Code of Federal Regulations and cross-references those word counts with the industries to which they apply. 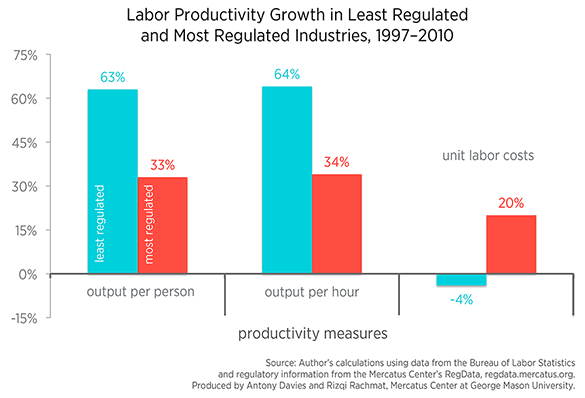 Comparing this data to production-efficiency measures from the Bureau of Labor Statistics shows that industries that are subject to less regulation have significantly higher production-efficiency measures than industries that are subject to more regulation. And here are some sobering numbers from the Competitive Enterprise Institute. They show that regulatory compliance costs are now larger than the costs – for both households and businesses – of obeying the income tax. Maybe now you can fully appreciate this Nate Beeler cartoon. Let’s close with some specific examples of regulation run amok. First, Kevin Williamson of National Review writes about the deadly (no hyperbole) decision by the Food and Drug Administration to block additional patients from receiving a promising treatment for the Ebola virus. When you are infected with Ebola, you are not very much worried about the possibility that you might get sick — you are sick, horrifyingly so, and mortally so in more than half of all cases. Worrying that your health might take an additional turn for the worse after you’ve been infected with Ebola is like noticing that your car’s check-engine light has come on a half-second after you’ve driven it over the rim of the Grand Canyon. And so the controversy over giving experimental Ebola drugs to two American aid workers, Kent Brantly and Nancy Writebol, and whether to extend the same option to dying people in Africa, is a strange one. …the drugs should be released, but the World Health Organization is hearing none of it. The experimental Ebola serum, which has shown promise in tests on monkeys but has not been through human trials, may very well have saved the two aid workers’ lives. The serum, called ZMapp, is a project of Mapp Pharmaceutical of San Diego — one of those wicked pharmaceutical companies that are a favorite whipping-boy of health-care reformers while they are quietly working to save the world — in collaboration with Dreyfus Inc. and U.S. and Canadian health agencies. Mapp seems ready and willing to get moving: “Mapp and its partners are cooperating with appropriate government agencies to increase production as quickly as possible,” the firm said in a statement. But use of ZMapp remains “under the regulatory guidelines of the FDA.” An American firm with a potentially life-saving drug is allowed to administer it to two Americans, while 1,600 or more Africans are denied… Ebola experts including Peter Piot, the discoverer of the virus, argue that African doctors and patients should be given the same choice that was given to Kent Brantly and Nancy Writebol. He’s right. The Ebola episode, isn’t an isolated example. It isn’t just Africa, of course. Every year, Americans in the late stages of terminal illnesses are denied access to experimental treatments by the FDA, on the theory that untested drugs might make these dying people sick. The agency’s “compassionate use” program, which gives some leeway in the use of unapproved drugs, is cumbrous and narrow, and, like most regulatory programs, is much more oriented toward the FDA’s institutional interests than those of the sick and dying people the program allegedly is there to serve. The FDA is not there to look after Americans’ health; the FDA is there to look after the FDA. And that can have deadly consequences for sick people. Here’s a story, from Washington’s Freedom Foundation, about the Forest Service using its regulatory power to abuse a disabled veterans. The story began about four years ago, when a small rock slide covered the entrance portal to Nicholas’ mine and, based on Forest Service rules and bureaucratic obstruction, he was forbidden to clear the slide debris with heavy equipment. In addition to inventing new excuses and red tape to delay Nicholas’ rightful access to his claim, the agency also decided to seize his trailer and related equipment located at his mine, valued at $68,000. …The USFS managers were very capable of inventing new justifications, excuses and delays to pick on Nicholas, and they apparently had plenty of time and energy to do this. Fortunately, we have a happy ending. While the Forest Service was denying Nicholas the ability to access his equipment with a backhoe because it might disturb spotted owls or cause some other imaginary terrible event, they admitted they could not prevent Nicholas from removing the small debris slide by hand. The bureaucrats appeared to think this was amusing because they knew Tony was disabled, and he wasn’t physically able to move these rocks. They never considered that his neighbors would come to Nicholas’ aid and move tons of rocks for him. This is exactly what happened in late June when – led by Manweller, 50 volunteers showed up at the Liberty Café in Cle Elum, drove up to Nicholas’ mine claim and moved many of the rocks. I’m glad things worked out, but who would have thought the Forest Service would behave so poorly? Then again, we recently learned that the Park Service was filled with spiteful bureaucrats. Here’s one final example of ludicrous regulation, this time from Nebraska. I confess that horse massaging sounds as odd as getting a psychologist for your cat, but maybe I’m behind the times. Regardless, it’s absurd that you could get thrown in jail for rubbing a horse! Or for selling milk. Or transporting a bagpipe. As Joe Biden said, it’s time to take back America.